Frozen Yogurt has been the newest trend lately, especially for health fanatics and those that are trying to lose weight yet still crave for those sweet desserts. But little do people know, that sweet treat might just be as dangerous as your traditional ice cream – maybe even more. If you’re health focused, then you might want to look closely at those ‘nutritional facts’ before indulging on this 'healthy dessert'. Follow me as we uncover the facts behind frozen yogurt. First, let’s find out how a basic yogurt and ice cream are made. A live culture of micro-organisms (good bacteria) converts milk into yogurt after a fermentation process. A dose of fruits, sugar and other sweeteners may be then added to flavor the yogurt. In comparison, a sweet treat has to contain 10% milk fat in order for it to be officially labeled as ‘ice cream.’ This “cream” is the main difference between yogurt and ice cream and sets yogurt apart with its nutritional value. But is yogurt always healthier in comparison to ice cream? Let’s find out! Based on the definition above, one of the reasons why yogurt is deem healthier than ice cream is that it contains less to no fat at all. A regular cup of ice cream contains 280 calories, 5g of protein, 30g of carbohydrates, 28g of sugar, 15g of fat and 9g of saturated fat while a regular cup of yogurt (without toppings) contains 220 calories, 5g of protein, 40g of carbohydrates, 19g of sugar, 5g of fat and 3g of saturated fat. Based on the nutritional values, it is clear that yogurt is the winner both in calories and fat content but take note that this is based on a plain yogurt, without any toppings. 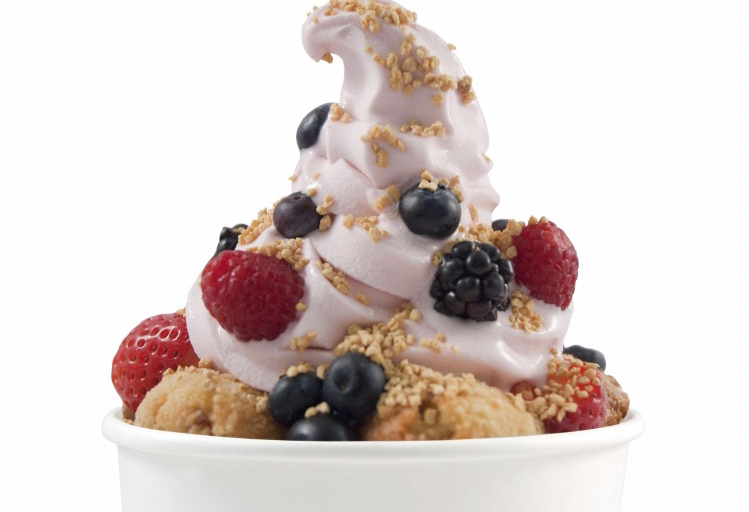 Also, it is important to note that frozen yogurt contains more calories and twice as much sugar than refrigerated ones! Yogurt still has a better overall content than ice cream especially with its good bacteria (Streptococcus thermophiles and lactobacillus bulgaricus). But the truth is, most of those live bacteria don’t live long enough for you to obtain its benefits. Factors like high temperatures and manufacturing can kill those delicate bacteria which means that the amount of bacteria present in a frozen yogurt is a lot less than the yogurt where it was made from. 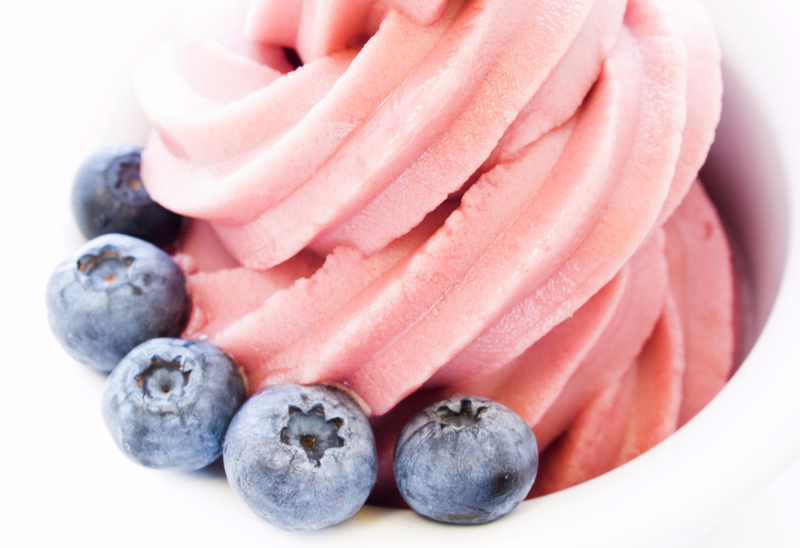 Another thing you need to know is that, not all “frozen yogurt” contain live and active cultures (good bacteria). Some of the treats you buy in your store are actually heat-treated yogurt which kills the bacteria in it. In order for you to know if the yogurt you’re buying contains live and active cultures, look for the NYA Live & Active Cultures seal before buying. Overall, I’d still say that yogurt is the best choice for your frozen treat but it doesn’t mean that it’s always guilt-free and a healthier choice. Read the actual label for the nutritional value and facts behind that sweet delight! Also, always opt for fruits and dark chocolate as toppings. Add-ons and toppings will add up to its overall calorie content so choose for the healthier ones! Lastly, if you’re trying to lose weight, it’s not just the fat that you’re trying to check -- it’s the calories. Although yogurt has lesser calories, discipline must still be applied when consuming this sweet treat to avoid irrepressible eating. Bottom line is, lesser calories doesn’t necessarily lead to a lesser waist line.